On invitation by The Incredible Machine, Ianus Keller was invited to talk about Design and the Internet of Things at the seminar The Day the Doorbell Rings You at the Dutch Design Week in Eindhoven on October 26, 2012. 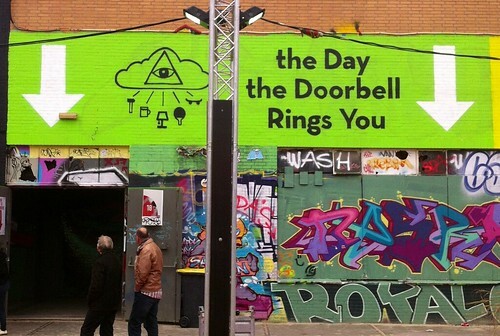 My colleagues and former students from The Incredible Machine organized an exhibition and a seminar entitled The Day the Doorbell Rings You during the Dutch Design Week 2012. I was invited as the final speaker to set up things for the discussion. After a wonderful introduction by Marcel Schouwenaar, the other speakers gave excellent examples of technology enabled plants, longboards, hack days, clothes and notifications. To get the discussion going, I talked about the Threshold of Adoption, trying to explain when that day the doorbell rings would finally arrive. My thesis, combined two seemingly contradictory ideas introduced by Bill Buxton about how technology relates to user adoption: The Long Nose of Innovation and Buxton’s Law. The Long Nose of Innovation explains how technology generally takes 20 years to go from invention to mainstream. Buxton’s Law combines the notion that technology and therefore the amount of features in our products grows over time (also known as Moore’s Law) whereas human capacity is not increasing, creating a threshold of frustration where we don’t use the features given in our products. So, how does technology get beyond this threshold of frustration and mainstream? I suggested Keller’s Law (containing 95% Buxton), explaining that technology needs to get over a speed bump called the Threshold of Adoption. The way to get over these bumps is to offer something that is either uniquely useful, almost frictionless or socially valuable. The role of design in these three influences is different, either inventing something that solves a need, picking the right technologies to make it frictionless or making your design communicative. I completed my talk with a couple of examples of my experiences with new technologies: how I got over the threshold of adoption and how these technologies changed as I was adopting them. Similar to how a painter or a photographer has to be good at looking at the world around them, I suggested interaction designers to also train themselves in intensely using the products in the world around them. 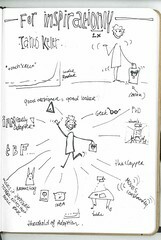 Update: Designer and curious human being Lemke Meijer was in the audience and made sketchnotes of all the talks. I have added her impression of my talk on this page, but you can find more of them in this Flickr slideshow.